A delicious, heart healthy meal that not only is beautiful but tastes amazing. 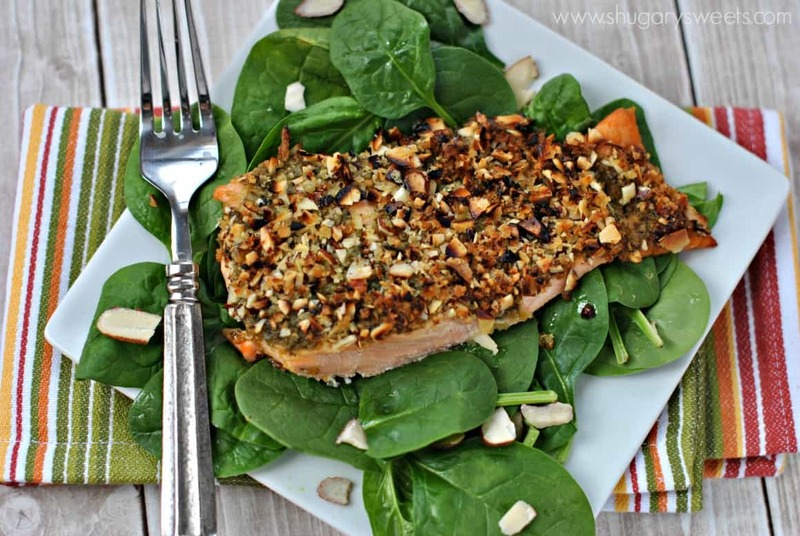 Oh, did I mention this Almond Pesto Salmon is also super easy to make? It took me a long time to learn how to make fish. I mean, sure, anyone can throw some frozen fish in the oven, bake and eat. But I’m talking about restaurant quality, melt in your mouth, delicious fish. Today’s salmon recipe is just that. It’s one of my favorite (if not my VERY favorite) seafood recipe I’ve shared on the blog. I know. I don’t say “favorite” or “Best” lightly. Because I know you all trust me, I don’t want to throw it around like candy. Many of you may think my family eats sugar and cupcakes every day. But while we rarely skip dessert, we also eat lots of healthy food too. I try to serve fish once a week in our house. We devour fruits and veggies like there’s no tomorrow. I really should live on a farm given the amount of fresh produce we eat. However, creating a salmon recipe that is not only amazing but heart healthy was my goal for this recipe. Of all fish, salmon is by far our favorite. Of all nuts, almonds are by far my favorite. Fisher nuts are so easy to find in their blue bags! Did you know several studies have reported on the nutritional value of nuts and that they contain higher amounts of mono- and poly- unsaturated (good) fats and lower amounts of saturated (bad) fats. Nuts can also be excellent sources of important vitamins and minerals, such as the antioxidant vitamin E.
I love grabbing a handful of almonds as an afternoon snack. It’s enough fats and protein to keep me satisfied until dinner! 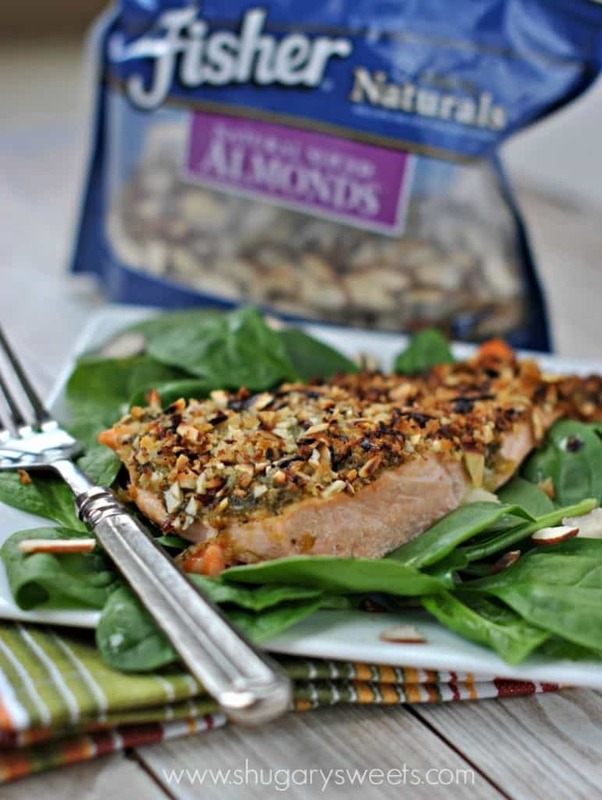 Add those nuts to some salmon fillets and a bed of spinach and you’ve got one amazing meal. 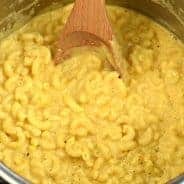 I used Fisher sliced almonds for this recipe. Prior to mixing them with the panko crumbs, I gave them a rough chop with my knife. I LOVE the texture the sliced almonds give to the crust, and the nutty flavor is perfect. 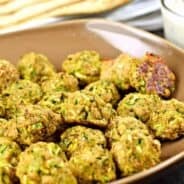 I also used store bought basil pesto, but you can easily make your own if you prefer (here’s my favorite recipe). In a small bowl, combine the chopped, sliced almonds with the panko crumbs. Set aside. Line a large baking sheet with foil. Lightly spray with olive oil. Place each salmon fillet on the foil lined baking sheet, leaving an inch between pieces. If your salmon has skin, you can remove it first, or place the salmon skin side down on the baking sheet. Spread the top of the salmon with basil pesto, evenly distributing the pesto to each piece of salmon. Take a handful of the almond/crumb mixture and press it onto each salmon fillet. Use all of the mixture. 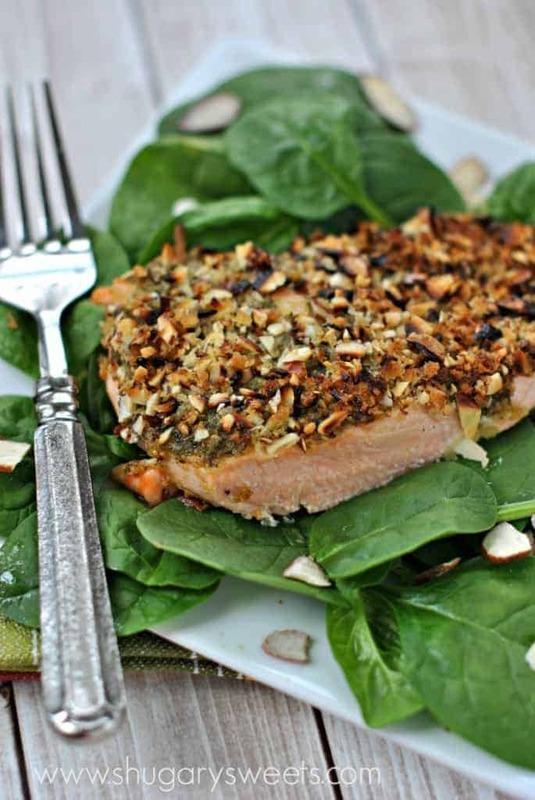 Lightly spray the tops of the almond crusted salmon with olive oil spray. Broil in MIDDLE rack of oven for about 7 minutes. Move oven rack to top and broil an additional 2 minutes. Salmon should flake with a fork. Depending on the thickness of your fillets, you may need to add or subtract baking time. 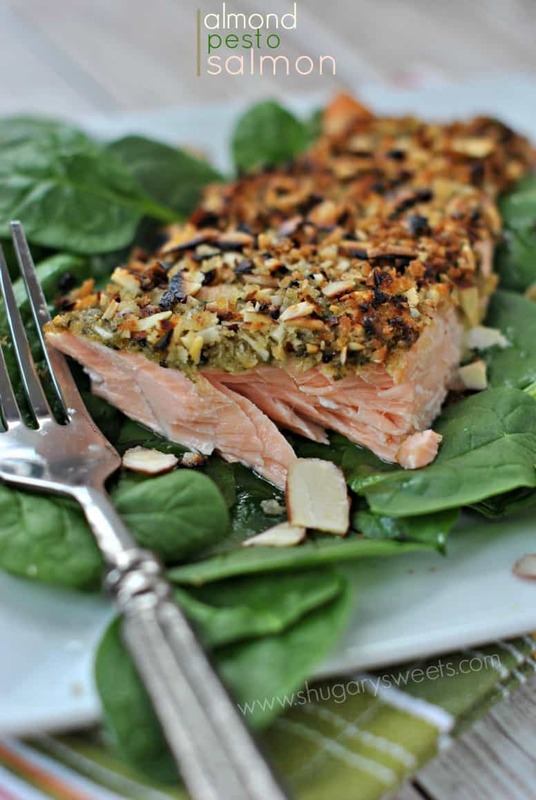 What is YOUR favorite way to eat salmon? How do you incorporate heart healthy Fisher Nuts into your everyday snacks? I bet that topping is heavenly!! And if you’re throwing around ‘best’ it’s gotta be so good! I LOVE almonds!! What a fun way to top a salmon! What a great way to use those heart healthy nuts!!! If you say it’s the best, I trust you!!! What a fabulous idea for salmon! So easy, too! Salmon is one of my favorite types of fish to eat! Love how it just flakes when cooked properly! The nuts make this extra special! I have been craving salmon lately! This looks so good. Salon + Pesto are two of my all time favorites so together with those almonds must be amazing. One of my favorite restaurants does a salmon with pesto but those almonds on top I bet add such fabulous texture!! Why have I never seen pesto with salmon before? This is perfect! Love love love! 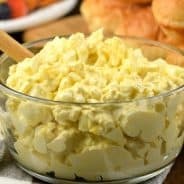 My SIL is going to FREAK over this recipe! She’s a total salmon nut, and this looks SO GOOD! Pinned! Thanks Ashton! Hope she enjoys the recipe (thanks for pinning)! How do you make pesto or do you buy it..? This does look awesome! 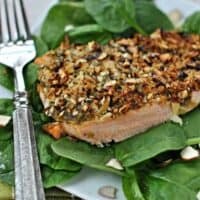 Unfortunately my salmon loving son has a nut allergy…but maybe I can make him the version I just blogged about while trying this out for us grownups some time! Yes, you must try it (when he is not around of course)! Thanks for stopping over! Gotta give it to you…fish always looks like an easy thing to get it right…but it does take some skill! Haha, love that your pesto ban has been lifted!! I’m so glad you enjoyed the recipe Holly! Thanks for stopping back over and letting me know!